Baldor-Reliance Farm Duty Motors Are Used For Both Farm And Commercial Applications That Require Continuous Duty. 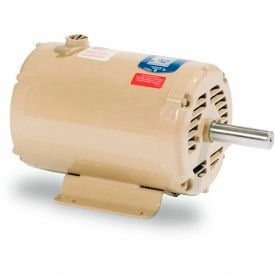 Baldor-Reliance Farm Duty Motors are made of heavy duty rolled steel for long lasting durability. Features a totally-enclosed or open design for superior performance. Epoxy paint finish for added protection. Can be used for aeration fans, auger drives, metering pumps, grain stirring, instant reversing, irrigation tower drives and crop driers for enhanced versatility. Available in both single and three phase for ease of use. RPM, voltage and horsepower vary per model. Package quantity is 1. Heavy duty single phase Hi-Torque Motors are designed specifically for severe "farm duty" applications. Mechanical Features: Gasketed capacitor housing and conduit boxes provide protection in all environments. Double sealed ball bearings prelubricated with Exxon POLYREX® EM grease having operating temperature range of -20°F to +350°F and special formulation to provide extra bearing protection. Rubber boot over manual protector reset button provides weather protection. Electrical Features: Low temperature manual overload protector protects against extreme overload. Class "F" copper windings and varnish. Capacitor start provides high starting torque with normal starting current. 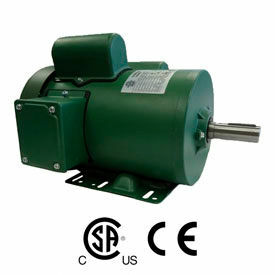 Heavy duty single phase Hi-Torque Motors designed specifically for severe applications. Electrical Features: Low temperature manual overload protector protects against extreme overload. Class "F" copper windings and varnish. Capacitor start provides high starting torque with normal starting current. All 180 and 210 frame Rolled Steel motors have Class F Insulation. 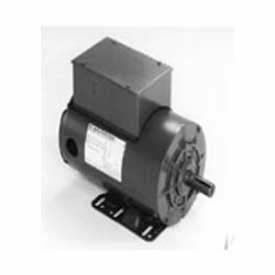 High Torque C Face AC Motors Are Used For Various Agricultural Power Applications. High Torque C Face AC Motors are solidly manufactured for long lasting use, durability and dependability. Totally enclosed, fan cooled (TEFC) continuous duty motors feature NEMA C Face design with overspeed protection on mechanical centrifugal starting switch. 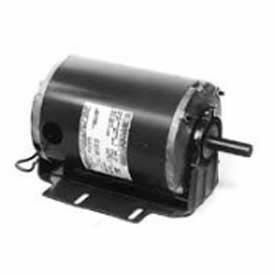 1/3, 1/2, 1, 1-1/2, 2, 3 and 5 horsepower 1725 and 1740 RPM motors are available for 56, 145 and 184 frames with various amps, and voltages. Leeson High Torque Motors, C Face With Base, Single-Phase, TEFC Are Used For A Variety Of Agricultural Motor Applications. 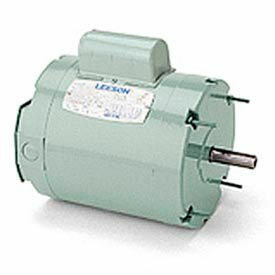 Leeson High Torque Motors, C Face With Base, Single-Phase, TEFC are made of rolled steel for long lasting durability. Designed with overspeed protection on mechanical centrifugal starting switch. HPs are 1/3, 1/2, 3/4, 1, 1.5, 2, 3 and 5. Frames are 56, 56H, 145 and 184. RPMs are 1,725 and 1,740. Available in a variety of voltages and amps. 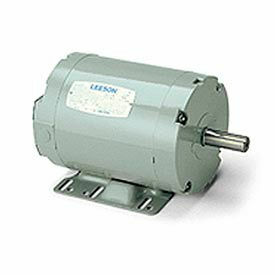 Leeson Aeration Fan Motors Are Used For Agricultural And Other Applications Requiring Protection From The Environment. 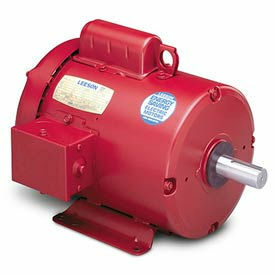 Leeson Single Phase, Rigid Base, Aeration Fan Motors are solidly made for long lasting durability and dependability. Totally enclosed air over motors are dust-tight, suitable for shaft mounted fans or belt driven fans. Capacitor start designs. Use within the airflow of the driven fan offers protection from the environment. Finished in epoxy enamel to resist corrosion in tough atmospheres. Lubricated with high temperature Exxon POLYREX® EM lubricant. Grounding provisions. Fully gasketed. Built-in terminal panel for quick, easy connections. 3450 RPM. Available in .75, 1, 1.5, 2 and 3 horsepower. 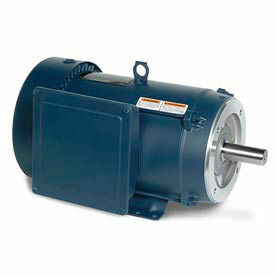 Totally enclosed air over motors, dust-tight, suitable for shaftmounted fans or belt driven fans. Capacitor start designs. 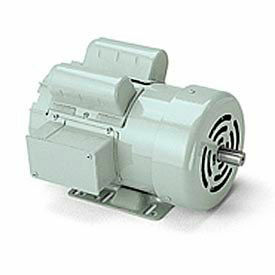 Designed to be used within the airflow of the driven fan, these motors offer protection from the environment and are finished in epoxy enamel to resist corrosion in tough atmospheres. Lubricated with high temperature Exxon POLYREX® EM lubricant. Grounding provisions. Fully gasketed. Single phase motors have built-in terminal panel for quick, easy connections. These fan and blower duty motors are designed for dependable, energy saving performance in applications where the fan is mounted on the shaft of the motor. The permanent split capacitor design does not require a centrifugal switch, resulting in higher reliability than on other types of single phase motors. This design is also more energy efficient and less expensive to operate. 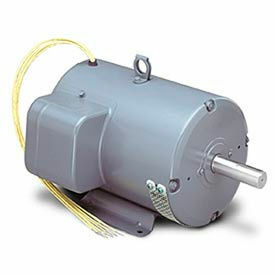 These motors may be operated at listed speed or two speed operation may be achieved by using the proper auxiliary switch. Overload protected with an automatic reset protector. Grounding provisions. Totally enclosed, dust tight design. Lubricated with quiet running high temperature lubricant. Corrosion resistant finish for tough applications. 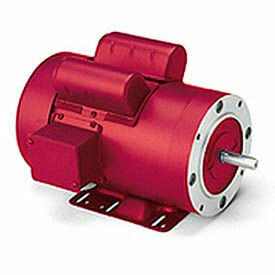 Because of the inherently low starting torques of this design, these motors are not suitable for belt driven fan applications. They must be mounted within the air stream of the driven fan. Totally enclosed, high efficiency, permanent split capacitor motor for direct drive exhaust ventilation fans in poultry and livestock houses. Fully gasketed, dust-tight construction with sealed bearings and shaft slinger. Automatic thermal overload protector. Extended through-bolts for mounting, no base. Built-in terminal panel for quick, easy connection. Grounding provision. Because of the inherently low starting torque of this design, this motor is not suitable for belt-driven fan applications It must be mounted in the air stream of the fan for cooling. Crop Dyer Motors Are Used For Various Farm-Related Applications. Crop Dyer Motors are solidly manufactured for long lasting durability and dependability. 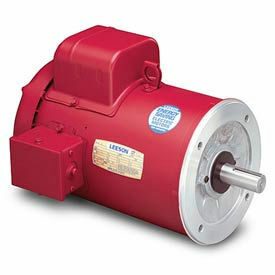 Wide selection of Leeson® and Marathon® brand motors designed for various farm-related applications. Designs include motors suitable for aeration fans, auger drives, grain stirring, metering pumps, instant reversing, irrigation tower drives and crop driers. Single and 3 Phase units with 3450 and 3600 RPMs are available with 3 and 10 horsepower and 3-5, 5-7, 5-7.5, 10-15, 7.5-10 and 7-9 variable horsepower for various rigid frame and voltage designations. 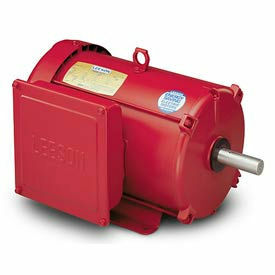 Leeson Grain Stirring Motors, Dust Tight, Single And 3 Phase, Rigid Base, TEFC Are Designed To Operate Inside Agricultural Storage Bins For Stirring Grain, Corn And Other Agricultural Products. 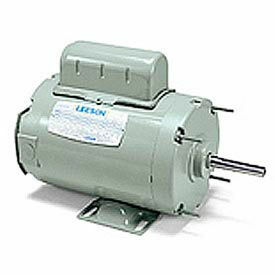 Leeson Grain Stirring Motors, Dust Tight, Single And 3 Phase, Rigid Base, TEFC are made of rolled steel and cast aluminum for long lasting durability. Energy-saving, extra high torque designs provide external cast aluminum cooling fan at shaft end to keep grain from obstructing fan operation. Prelubricated double shielded ball bearings packed with Exxon POLYREX® EM grease (temperature range -20°F to +350°F). Provides totally enclosed construction with gasketed conduit box and capacitor cases. Moisture drain hole in endshield opposite shaft allows for vertical shaft up mounting. Includes 205 bearing shaft-end, 7/8 in. diameter shaft and 15/16 in. useable length. Extra quantities available. Voltages are115/208-230 and 208-230/460. HP is1.5. Phases are1 and 3. Frame is56H. RPM is1,725. Specially designed for aeration systems used on aquaculture ponds, these motors are designed for dependable outdoor applications. Typically C-face connected to a right-angle gearbox and installed on a floating aeration platform. Hi-torque motors are epoxy-painted with a corrosion-resistant interior coating. Stainless hardware, fan guard, lifting lug, and conduit box cover for maximum protection against corrosion. Drain holes in the conduit box and in four positions on each end of the frame to purge condensate and moisture that may enter the motor. Ball bearings are double-sealed and lubricated with Exxon POLYREX® EM high temperature, moisture resistant lubricant. All 180 and 210 frame Rolled Steel motors have Class F Insulation. Marathon Motors Aeration Fans, HVAC Motors Are Designed For A Variety Of Agricultural Applications. Marathon Motors Aeration Fans, HVAC Motors are constructed with a cast iron frame for long lasting durability. Designs include motors suitable for aeration fans, auger drives, grain stirring, metering pumps, instant reversing, irrigation tower drives, and crop driers. Totally enclosed/air over motor designs must be mounted within airstream for proper cooling. UL Listed and CSA Certified. Available horsepower's are 3/4, 1, 1-1/2, 2 and 3. Voltages are 230 and 115/230. RPM is 3,450. Frames are 143TZ, 145T, 145TZ and 56Z. Quantity is 1. Marathon Motors Farm Duty, Single And Three Phase Motors Are Designed For A Variety Of Agricultural Applications. Marathon Motors Farm Duty, Single And Three Phase Motors are constructed with a cast iron frame for long lasting durability. Designs include motors suitable for aeration fans, auger drives, grain stirring, metering pumps, instant reversing, irrigation tower drives, and crop driers. Totally enclosed/air over motor designs must be mounted within airstream for proper cooling. UL Listed and CSA Certified. Available in a variety of horsepower's from 1/6 to 10-15. Voltages, RPM's and frames vary per model. Quantity is 1. Worldwide Electric Farm Duty Motors Are Desgined For Tough Applications In The Agriculture Industry. Worldwide Electric Farm Duty Motors are made with a TEFC enclosure and IP54 degree of protection to provide long lasting durability. High torque, 1.15 service factor, Class F insulation and VPI copper windings provide optimum performance. Motors feature reduced amperage and high torque with manual overload, drive-end shaft seal, drive-end bearing retainer, double-sealed ball bearings, gasketed capacitor covers and junction boxes. Anti-rust film applied to rotor for weather protection. Color coded and labeled motor leads provide organization. Horsepowers range from 0.33 -2. FL Amps range from 5.2 - 19.6/9.8. FL Effeciencies are 63, 64.5, 67, 70, 77 and 79. 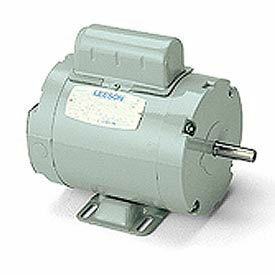 Leeson Motors - 1/2HP, 115/208-230V, 1725RPM, TEFC, Rigid Mount, 1.15 S.F.